A powerful and upsetting movie about the genocide that went on in africa and how one man tried to help as many people as possible. This is an intense movie about murder and senseless violence that went on among people in africa. when one group of people becomes empowered, and the belgian government leaves, all hell breaks loose. murder floods the streets and the other group of people see themselves becoming the target of killers who want them wiped out. don cheadle plays paul, a hotel manager, whose family is in trouble. he has to figure out a way to not only save them, but also as many people as he can, from the horror that is all around him. this movie is very well-made and captivating. it actually moves so fast that sometimes you wish it would slow down a bit and explain a little more. still it does, easily, hold your attention the whole way through. 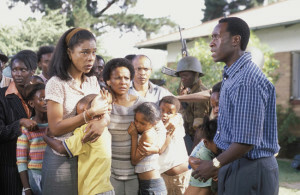 Hotel Rwanda is one of the most violent and upsetting movies about africa around. there have been a lot of these movies in the last ten or so years. from blood diamond to the last king of scotland to machine gun preacher, everyone of them is filled with violence and genocide. it’s the movies that find a unique angle of some sort that stay memorable among the bunch. in particular, this movie and the last king of scotland. of the four films listed, Hotel Rwanda is the only one that is entirely about people from africa. the three other films are about fish out of water characters who visit the land and are shocked by what they find. whether it’s leonardo dicaprio, james macavoy, or gerard butler, none of these three leads can present the harsh realities of the situation in the same way as an actor playing a character who actually lives there. that’s what don cheadle gives us in this movie. when the film begins, we are meeting paul (cheadle), a hotel manager in a high end place owned by some wealthy belgium businessmen. of course those businessmen are nowhere in sight, and live all the way in belgium, where they speak to paul via phone, to make sure that things are running smoothly in their hotel. paul begins the movie by visiting suppliers and explaining the ways that he has learned to wine and dine the people who need to be pampered. when he goes to see one supplier, he talks about a rare cigar and how it actually has more value than the money it is worth, because all of his clientale have money, but this cigar is a rare treat. paul also happens to notice a box that falls and breaks, at the supplier’s establishment, and has a ton of machete blades spill out of it, onto the floor. this is foreshadowing of what’s to come. the machete’s, which are sort of in the background here, will start appearing more and more in the film. as paul leaves the supplier, he talks with his driver about the different conflicts going on in rwanda at that time. the hutu people have come to power and are taking out their anger over being oppressed for years on end, on the tutsi people. the history has it that when the belgian’s ruled rwanda, they empowered the tutsi. now that the belgians’ have gone, the hutu are taking over and are seeking vengeance on the tutsi by killing them all. paul’s driver is a tutsi. so is paul’s wife. the next clue to what is about to unfold comes at night when paul is with his family, inside his home, and hears a commotion outside. he peaks out of his gate just enough to see his neighbor, from across the street, being harrassed by armed militia and beaten. when his wife asks paul to do something, he explains to her that things have gotten so bad, that he can only look out for his family. he is in no position to save everyone, and is even afraid to open his gate more than a crack in this instance. things really have gotten bad. there are white reporters there at the start of the film, (like one played by joaquin phoenix, who has very limited screentime here), and they start out wanting to make a difference, reporting on the nonsensical violence. pretty soon these reporters realize that it is far too dangerous for them to go out to the areas where the story is really happening, and they leave before the conflict reaches them. aside from the reporters, there are some other white people here, trying to help resolve the conflict. there is a woman from the red cross who is primarily concerned with getting the children to safetey, and then there is the u.n. forces, represented mostly by nick nolte, who there as, “peace keepers, not peace makers.” in other words, he’s not there to change anything, but only to aid in keeping things the way they are. when things get too out of hand, even he and his men must leave before the conflict reaches them. while all of this is going on, paul and his family take refuge at the hotel. he hopes that this place will be considered off limits to the hutu army, but unfortunately he finds no such luck. 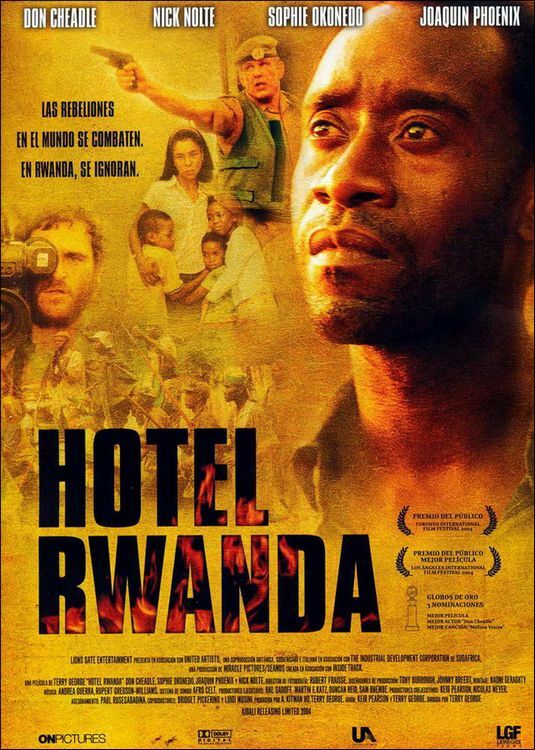 while he is trying to keep a low profile in the hotel, paul finds himself being blackmailed by an employee who knows that paul’s wife and family are tutsi. this man demands to be put up in the presidential suite, claiming that he will tell the armed men of paul’s secret if not given exactly what he desires. even with giving this man what he asks for, the conflict still reaches the hotel doorstep pretty quickly. paul finds himself having to go into the hotel safe and pay off the military just to turn their backs on his family and let them keep their lives. they go away after being paid off, but it seems like only a temporary solution to a problem that is only getting worse each day. at one point paul goes back to see the supplier from the early moments of the film. this scene is important because it shows us how much things have changed and how much worse they have gotten since the movie began. paul’s relationship with this supplier has also changed, with the supplier now acting like a man of power who is able to take advantage of paul in his terrible situation. as paul is leaving the man, the supplier tells paul to take a certain path on his ride back to the hotel. paul and his driver take that path and end up running over a ton of dead bodies. it’s a pretty horrific moment as they get out of their van to see the atrocity all around them. the u.n. soliders come back for the final portions of the film and there are two different escape attempts. paul has some important decisions to make with each of these, and neither one of them runs as smoothly as he would have hoped for. at one point, nick nolte has to get out of his vehicle and hold a gun on the men who are threatening him. even still, he can’t get the people out of rwanda like he hoped to do. this is a very powerful movie. it is dark and disturbing, and really puts the audience in the shoes of the characters, the same way that the last king of scotland did. part of what make these movies so unique is their focus on telling the story in gory detail instead of appealing to a mass audience. Hotel Rwanda definitely pulls off what it’s going for and is a cery powerful film.